I've long held an ambivalence toward beans. They're something I know I should like and I should eat more often but I can never get excited about it. That being said I have been looking forward to making some homemade baked beans for a long time now and tonight was just the night to make that happen. I had some beans leftover from August and I knew I had to use them soon before they gave up the bean ghost. To start I soaked them overnight, then I cooked them this morning, and after an exciting trip to a New Jersey Ikea, I threw them in the oven. I added a little water, ketchup, mustard powder, salt, pepper, molasses, Worchestershire sauce, and brown sugar. I also chopped up some of the skin side of the leftover ham stead from the other night and added the skin, fat, and leg bone before throwing them in the oven for three or four hours. When they were done I served them on a slice of toasted cornbread. 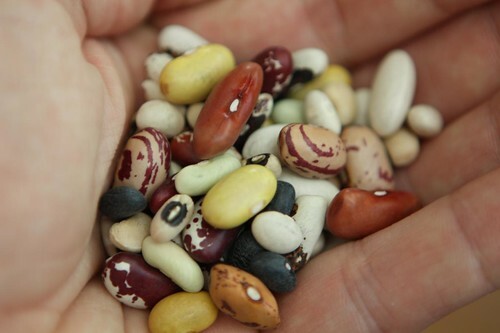 Since I'd started out with these precious little heirloom beans I had the idea to turn them into beans on toast. However, since they were fancy pants beans I could not simply use a slice of white bread. 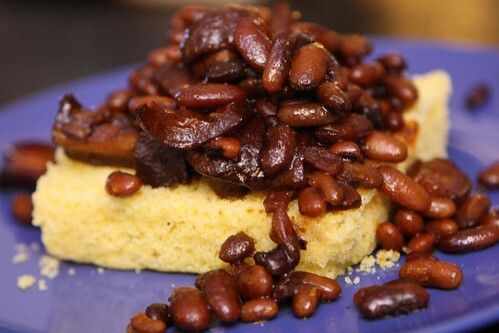 No, this called for something decidedly more fancy pants, thus the cornbread. 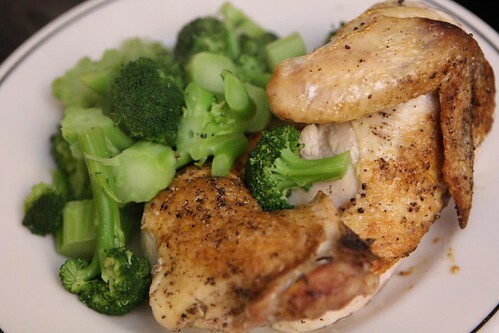 To accompany the baked beans I roasted a chicken and served it with some steamed broccoli and a salad. That's right, the chicken was an accompaniment to the beans! That's just how fancy pants they were! 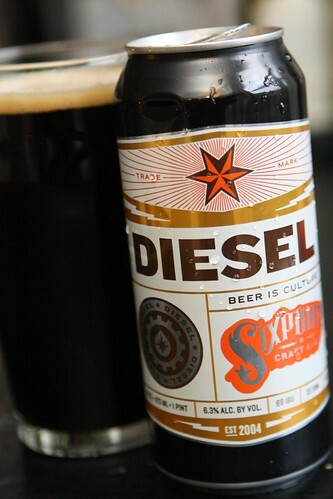 For beer I enjoyed this Diesel from Sixpoint Craft Ales. I've been eyeballing this one for a long time and I finally got around to cracking one open. This is a truly unique beer, kind of a cross between a porter and a stout with delicious notes of bitter chocolate and coffee. Normally I'm not a huge porter or stout guy but this beer certainly hit the spot. In fact it was so good that I also added about a third of the can to the beans before cooking them. For dessert I served up this Sumo mandarin. These mandarins have been all the talk lately. At least they've been all the talk in circles where people stand around talking about citrus. These are the kinds of circles I generally travel in. You may think that sounds exceedingly lame but I assure you I'm a terrifically wild and exciting guy. I'm great at dinner parties. I drop all kinds of produce knowledge all over the place. 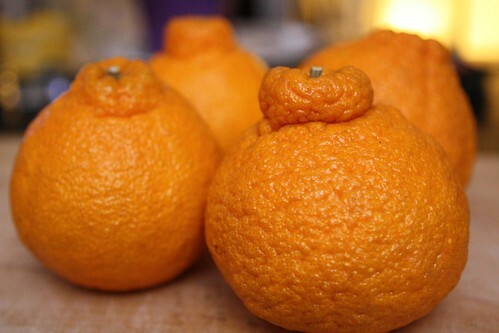 For example: did you know that Sumo mandarins are from Japan and are extremely silly looking? I bet you didn't. In my circles we'd refer to you as a classic Fruit Fool. Beans on toast are the meal. Period. I agree. I just didn't think that it would fly as the only meal option of the night. 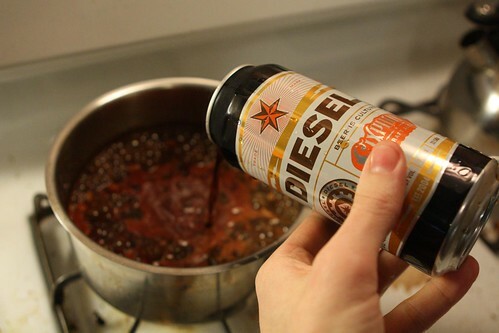 Beer in the beans. Yes! Those heirloom beans deserved beer. The photos made my mouth water; off to Key foods to find beans. Thanks! It came out pretty good. Next time I'd just make them a little more saucy.